Pilgrims Covenant Church will gladly send a free Bible to anyone in the USA who is in need of one. Please use the contact form at the bottom of this page to send your request. and add to our sermon and Heart of the Matter archives. Click here to read a gospel message. I am going to begin today by making a statement; and then I am going to go on to provide the evidence for that statement which is this: It is absolutely contrary to the will of God for Christians to place their children in the public, or state, school system. Our pastor has guest preached in churches in America as well as England, the Republic of Ireland, and Northern Ireland, also at events such as the United Protestant Council’s conference in London, England. We also have been privileged to have had a number of faithful men preach in our church. Below are a few of them. Lord willing, we will be posting some of the messages these men preached to us. Pilgrims Covenant Church (PCC) is an independent, reformed Baptist church which is fundamental in doctrine and biblical in government. Our concern is for sound doctrine and practice. We are also dedicated to sharing the gospel out in the world and are involved in supporting foreign missionary works such as a ministry in Nepal which includes evangelism, church planting, and an orphanage. We believe in the verbal and plenary inspiration of the Bible. We believe the Holy Spirit has inerrantly preserved every word of the Scriptures in the Masoretic Hebrew Text and the Traditional Greek Text. We believe that in the English language, the King James Bible, or Authorized Version, is a faithful and trustworthy translation from those texts. We reject modern English Bible versions due to the fact that all of them, to one extent or another, have been translated by faulty translation techniques and have been translated from the corrupted Alexandrian, or Critical, Text. (www.tbsbibles.org) We believe that Scripture interprets Scripture and that the Word of God in the Old and New Testaments is the supreme, only sufficient and infallible rule of all saving knowledge, faith, and obedience. We are committed to preaching and contending for the doctrines the Apostles taught and which were at the heart of the Protestant Reformation, beginning with justification by grace alone, through faith alone, in Christ alone, for the glory of God alone. We reject neo-evangelicalism, ecumenism, charismaticism, antinomianism, and Romanism. We love the souls of our Roman Catholic countrymen and recognize that many of them are sincere, kind, and principled. 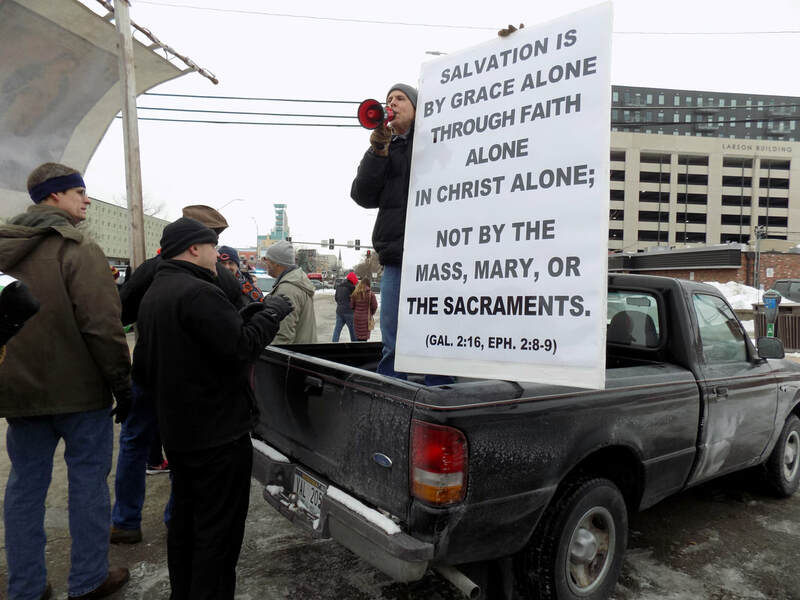 But we detest such Romish rituals as the blasphemous mass, and we are grieved that the Roman Catholic people are deceived by their priests into believing salvation is obtained by priestcraft, ritualistic sacraments, and good works. We hold to the historic Protestant position that the pope--every pope--is “that man of sin . . . the son of perdition” (2 Thessalonians 2:3), the Antichrist. We believe that Revelation chapters 17 and 18 describe the papacy and the whole papal system. We also believe strongly in religious liberty. So we hold that the civil government has no right to interfere with or infringe upon the right of either Protestants or Roman Catholics to freely exercise their religion. We worship with reverent hymns and Psalms. We reject as unscriptural, worldly, irreverent, and dishonoring of the Lord so-called Contemporary “Christian” Music (CCM) and “Christian” rap music. We believe that children of Christians should be educated in Christian schools or homeschooled. We strive to be faithful to the command of our Lord Jesus Christ: "Go ye into all the world, and preach the gospel."